Classic Dental Smiles > Classic Dental Smiles Blog > General Dentistry > Dentist Rancho Bernardo | Check Out Our Reviews! Dentist Rancho Bernardo | Check Out Our Reviews! 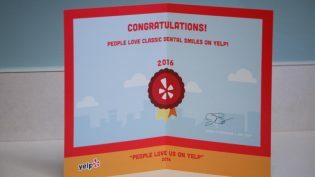 We recently received a huge honor from Yelp.com a few weeks ago. Many of our patients have left 5-star reviews for our office on Yelp and we couldn’t be more appreciative of all the support they have given us. In case you may not be familiar with this company, Yelp is a review website driven by everyday people who post feedback on local businesses ranging from restaurants and bars to spas and dental professionals. It has been quite a valuable resource for people looking for recommendations from others who are willing to share their experiences. Our office receives no financial compensation for being on Yelp, nor does Yelp receive any compensation from our office for all the positive reviews our business has received. This also applies to our review page on Google, Facebook, Nextdoor.com and Bestlocalreviews.com. We’ve worked really hard at providing excellent dental services in a safe and comfortable environment. If you haven’t already, we encourage you to check out all the positivity that can be found on all these review sites as well as the testimonial videos we have posted to our website (again, these videos are made by people who have received no financial compensation for their feedback). We understand how important it is to research a prospective dental office and feel this is a great way for new patients to get to know our office from other actual patients. Again, we are really thankful for all the support we have received and are honored for receiving this compliment from Yelp (they don’t give this out very easily). If you would like to see the office firsthand and/or meet Dr. Brian Chan and our staff, please reach out via email or phone at your convenience. We look forward to meeting you in person and becoming your trusted, lifelong dental providers in Rancho Bernardo!